A while back, I announced some changes to DaedTech with idea of moving toward a passive income model. In the time between then and now, I’ve spent a good bit of time learning about techniques for earning passive income, and I’ve learned that I’m really, really bad at it. For example, I’m often asked for recommendations, and I respond by supplying them, as most decent humans would. This is wrong. What I should do is have a page on my site with all of my recommended and favorite tools and the page should link to them via affiliate links. I provide the same recommendations and earn a bit of money. Win-win. Well, I’ve been halfheartedly working on this page for a bit. Believe it or not, the most difficult part of this is seeking out and obtaining the affiliate links. So, my page of recommendations remains a work in progress. And I was making progress tonight, securing affiliate links, when inspiration struck for a blog post about one particular affiliate. Most of the affiliates that I’ve identified are productivity tools, editors, and other techie goodies, but this one is different. This one represents an entirely different way of thinking for techies. 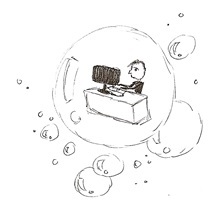 As a free agent, content creator, and product creator, I have a lot of metaphorical juggling balls in the air, and I’ve had to become hyper-productive and downright ruthless when it comes eliminating unnecessary activities. I don’t watch TV, I don’t go out much, I don’t take any days off of working, even on vacation, and I don’t really even follow the news anymore. Pretty much every conceivable bit of waste has been excised from my life, and I do a lot of work on an hourly or value basis. This has resulted in a whole new world of ROI calculations appearing before me — it’s worth paying premiums to save myself time so that I can spend that time earning more money than I spend. For a concrete example of what I mean, consider that I’ve recently hired a virtual assistant firm. I spend my time writing blog posts for pay or consulting on software strategy, and I pay them to handle tasks like researching venues for my wedding reception, booking business travel, researching health plans, etc. I make money while they efficiently research things that I’d flail at, inefficiently, wasting my time. That’s great for me as a free agent, entrepreneurial type. But what does it have to do with you? Well, I think you should do it too. No matter what you’re doing. The firm I use is MyTasker, and they’re awesome. (And, yes, if you sign up, I’ll theoretically make some money. But hey, I’d enthusiastically support you enlisting one of their competitors or signing up on their normal site without me getting the kick. I mean this.) You can ask for a free trial, and I think plans start at 10 hours per month for a total of $120 per month. So why should you get a VA, and why should you believe this is anything other than a ridiculous, crackpot scheme? Well, give me a few section headers, and I’ll try to make the case. The most straightforward reason is that you can free up your time. Let’s say you pay $12/hr for 10 hours of time for a total of $120 in a month. For that money, you can take advantage of an incredibly wide array of things that they can do. Seriously, the sky is the limit — these guys are impressive. I recently sent a task across that was ridiculous. I said, “I’m getting married on September 5th, and what I want is a stretch limousine to take me from Cassopolis, MI to O’Hare airport with a single, specific stop to pick up some luggage. I have a budget of $400, max, for this. Go.” They got back to me in half an hour, with a number, rates, availability, and asking whether I wanted them to go ahead and book it. Half an hour. I would have wasted half a day on that. The number of things that they can handle for you in 10 hours would blow your mind. They’ll find you cheaper rates on all of your monthly bills. They’ll find a good place to eat with vegan options for your sister in law. They’ll find the nearest Best Buy with the video game that you want in stock. They’ll make your life easy. 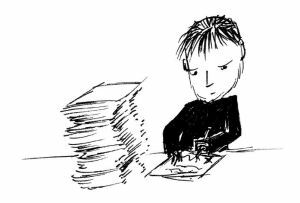 So far, I’ve talked about something that is essentially a convenience for people with first world problems — offload your annoying personal tasks. But it runs deeper than that. A lot deeper. But, before I get into that, I’ll list another rather superfluous benefit, which is that you’ll start to think of your tasks differently. Right now, you probably have some form of giant, monolithic, to do list. It might include stuff at work, getting groceries, updating your resume, looking for new tile for the kitchen, putting something on github, looking for a better deal on your gym membership, etc. If you start to pay money to a VA firm, something interesting will happen. You’ll find that your tasks separate like oil and water into “stuff I can delegate” and “stuff that requires me.” Not only is this separation an incredibly valuable skill, but it begins to show you where you’re essential and where you’re wasting time. You’re necessary for the work stuff, your resume, and github, but the rest of it… not so much. So even if you decide not to bother with the VA firm after a few months, you have a much better sense of what you can offload to family, friends, a neighborhood kid, etc. The last two items pale in comparison to what this means for your career. Perhaps you’re slinging code and perhaps you’re perfectly happy with that. God bless. As I’ve said before, programmer is absolutely a career path. But even if you don’t aspire to be The Boss, I imagine that you’ve at least contemplated it at some point. The office, the power, the importance, the impressive title. It has a certain allure, right? I remember being a relatively new entrant to the workforce and thinking it’d be awesome to be a boss. Strangely, at no point in that daydreaming did I think about what this would really entail from a nuts and bolts perspective. Forget the ego fanning and seniority perks — the real, tactical role of a manager is delegation on a day-to-day basis. You’re responsible for taking a giant mass of “stuff 10 people need to do” and breaking it into bite-sized, understandable chunks so that people can be productive. Being the boss isn’t all strolling in late and being an idiot — you need to develop a knack for giving people clear instructions, confirming understanding, establishing success criteria and following up. There is no better trial run for this than having a VA firm in your employ because having a VA firm in your employ is, literally, you becoming the manager of a team that you’re paying. You have to learn to give clear instructions, define success criteria, specify how long to spend before giving up, and generally define the task parameters (if you’re interested and a little daunted, send me an email, and I can offer you more suggestions). It’s your money on the line, so if you fail, you feel the pain of lost dollars. If your pointy-hair at work fails, he feels little, if any pain, eventually at some kind of review or something. You’re getting a trial by fire that he’s almost certainly never had unless he’s started a company. It’s all well and good to get managerial experience, but what’s the point unless you get credit for it, right? Well, help yourself to credit. Here’s what you should do. Pick a “company” name for yourself, submit a “doing business as” application, and name yourself “managing director” on LinkedIn and your resume. Next, hire a VA firm. Enlist them to help you figure out how to hang your shingle out as a freelancer, generate leads, set up profiles on freelance sites, etc. Now you’re in for $120 per month, and you’ve started a software consultancy and managed a team with a global presence. Sound like cheating? Nonsense. Seriously. Nonsense. The only archetype I have not yet covered from my “defining the company hierarchy” series is the opportunist, and this is exactly the kind of thing an opportunist would do. Let the pragmatists live forever at the line level and let the idealists wait around for someone to deem their dues paid after 10 years. Skip that. Take control. At worst, you’ll be out $120 for a few months, have earned some managerial experience, and have avoided some annoying tasks. 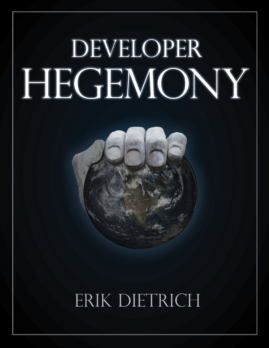 I’ll close with a philosophical thought that I’ll explain in a lot more detail in Developer Hegemony. Right now, we have line managers, project managers, account managers, program managers… well, you get the idea. There are a lot of managers. And then, there’s us — the grunt labor that, you know, does all of the actual, non-overhead work. As our salaries and wages continue to climb in response to demand, it’s going to become absurd to keep paying all of these managers more than us to ‘supervise.’ At some point, economics will force us to own our careers, even if we don’t do it ourselves first. When that happens, it’ll be us, the developers, that run the show. We’ll write code and we’ll hire administrative assistants to make Gantt charts, have planning meetings, and do all of the administrativa. It’s coming sooner or later, and when it does, you’ll be in much better shape than your competition if you’ve gotten used to delegating details while you worry about building things. Love the last paragraph! “Learn to manage yourself and delegate to others, because this is coming anyway” is great conclusion.